The Northern Illinois University women’s golf team is in fifth place after shooting a 320 at Harborside International Golf Center in the opening round of the Cougar Classic Monday. Northern Illinois is 11 shots behind leader IUPUI (309) and five shots out of second place, which is held by Indiana State (315). Cleveland State (316) is third, while host Chicago State (318) is in fourth. Leading the way for the Huskies is senior Allie Parthie (Marinette, Wis./Marinette), who is tied for fourth. Parthie shot a first round 75 and trails leaders Jordan Woods and Olivia Kuss of IUPUI by two strokes. Jenny Niemiec (St. Charles, Ill./St. Charles East) turned in her best round of the fall with a first round 77 and is one of four golfers tied for 13th. Sophomore Taylor Ellett (Hampshire, Ill./Hampshire) carded an 83 in her first round of play and is tied for 44th, while Casey LaBarbera (Marinette, Wis./Marinette) is tied for 60th after posting an 85. 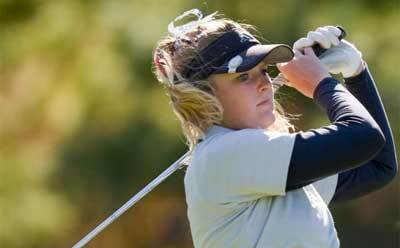 Connie Ellett (Hampshire, Ill./Hampshire) is in 81st after carding a 91 to round out the Huskie competitors. For more information on NIU women’s golf and Huskie athletics, visit www.niuhuskies.com.